After being retired, former Chesapeake and Ohio No. 2716 was transported to Louisville for static display. Here, it was photographed in Lexington, Kentucky, in May 1959. Photo Courtesy Kentucky Steam Heritage Corp.
A giant piece of Kentucky’s past will be rumbling through the bluegrass this summer. 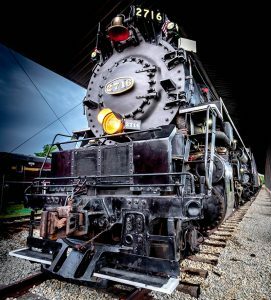 Chesapeake & Ohio 2716, a massive 75-year old steam locomotive, will be making a triumphant journey from the Bardstown area to Ravenna, Ky., July 26 through 28. The 400-ton engine is slated to be restored to operation, taking center stage at the new Kentucky Rail Heritage Center. The Kentucky Steam Heritage Corporation is spearheading efforts to help revitalize the regional economy in Appalachian Kentucky with a multi-faceted rail-based initiative. The locomotive’s move will be a mobile kick-off for the project, allowing the public to get an up-close view of a piece of the region’s past, and what may be a key part of its future. Thanks to collaboration from both CSX Transportation and Nicholasville, Ky.-based RJ Corman Railroad Group, the locomotive will be transported over a three-day period from the Kentucky Railway Museum, in New Haven, to Ravenna. The unprecedented event will also include several stops and a public excursion, the proceeds from which will be shared by Kentucky Steam Heritage and the Kentucky Railway Museum, both non-profit entities. Last May, Kentucky Steam announced that a deal had been struck with CSX Transportation to purchase a 40-acre tract of decommissioned railyard in Ravenna. 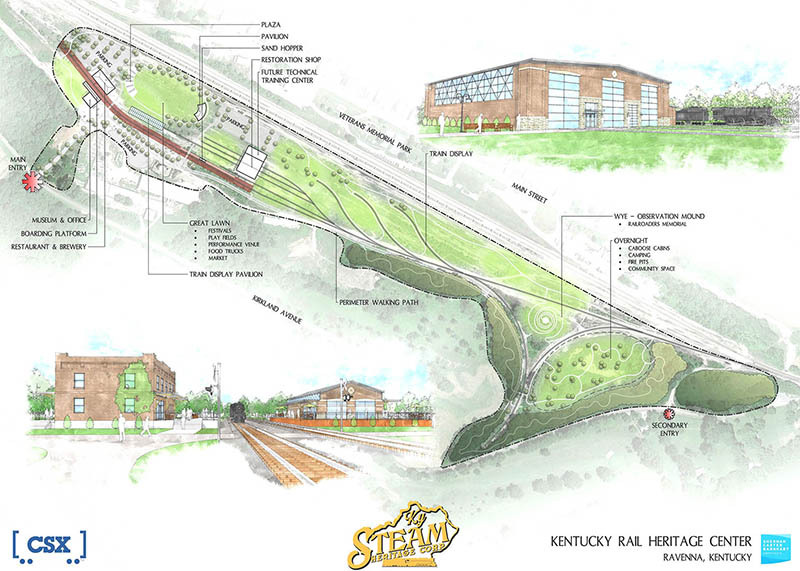 Ambitious development plans for the Kentucky Rail Heritage Center include a diverse set of attractions based around trains — a restaurant, brewery and event center, concert venue, walking trails and a railroad restoration shop which will include a partnership with Estill and Lee County schools. Area vo-tech students will be able to participate in the rehab of historic train equipment while gaining valuable technical skills training and program credit hours. The property was acquired from CSX in late-2018 and work began over the winter by a growing number of volunteers from the area and surrounding states. Many of the volunteers are drawn in by the chance to help rebuild the locomotive, one of the few remaining examples of what helped define the industry and economy of Appalachia. 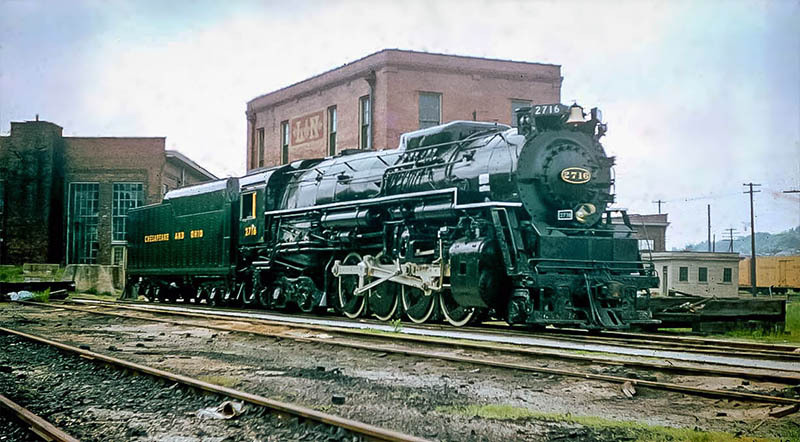 The proposed Kentucky Rail Heritage Center in Ravenna will be the new home for C&O 2716. Steam Locomotive 2716 was built in 1943 and operated pulling freight and passenger trains for thirteen years before being retired in 1957. It was donated to the Kentucky Railway Museum — then located in Louisville — by the Chesapeake & Ohio Railway in May 1959. Over the past sixty years, the engine has only operated for a few short months before being put on static display in 2001 at the museum’s new home in New Haven, south of Bardstown. Kentucky Steam leased the engine from the KRM in 2016, with the intent of restoring it to operation. Once rehabbed, it will be one of the largest operating steam engines in the nation. The process of restoration is costly, however, mainly because replacement parts have to be custom manufactured and fitted by hand. The group hopes to offset some of the costs of the restoration through donations and revenues generated by the upcoming public send-off excursion. 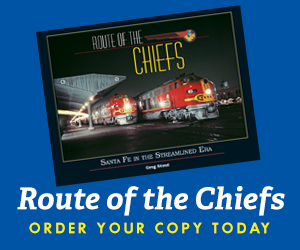 The move of the locomotive will be spearheaded by CSX Transportation and RJ Corman, a joint-effort that will result in photo opportunities, public tours and displays in several cities along the 200-plus-mile-long journey. 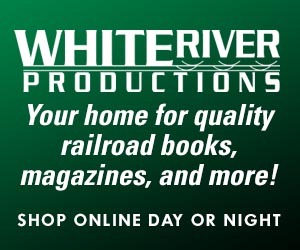 Details for the schedule will be solidified early this summer, but the tentative route should bring the locomotive through Louisville, Frankfort, Midway, Lexington, and Winchester before it arrives in Ravenna. The public will be able to access and tour the engine, as well as other pieces of historic equipment, at several predesignated stops along the route. Campbell stresses that while the series of events is intended to engage the public, safety is of the utmost importance. Tickets to ride the special July 26 excursion at the Kentucky Railway Museum featuring steam locomotive 2716 and other historic trains will go on sale on Thursday, April 18 at 9 a.m. EST. A limited number of seats are available. For more details and updates, information on membership, donations and for ordering tickets, visit www.kentuckysteam.org.